CBS 24K Gold CDs Shop MyMusicFix!! 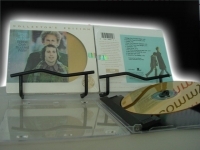 These CBS/Sony Mastersound Small Box Pressings are the only Original Master 24-Karat Gold CD pressing that have the actual Out of Print Pressing Date and Serial Number engraved into the flame-polished spacer. No other company went through this Limited Edition process on their 24-Karat Gold Masterpieces to verify the authenticity of these pressing dates for the collector. 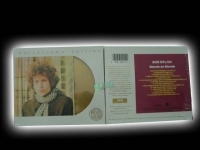 "Bob Dylan, Blonde on Blonde"
CBS Master Sound 24K Gold CD, voted the #9 rock & roll album of all time. This 1966 landmark album is considered by most Dylan-philes as his masterpiece. By blending a rich tapestry of blues, country, folk and rock, "Blonde On Blonde" is an album of limitless depth filled with lyrical and musical revelations. Recorded in Nashville with Al Kooper and Robbie Robertson, as well as other fabulous session players, the album is filled with cutting guitar riffs and liquid organ fills. Songs like "Rainy Day women #12 & 35", "Visions of Johanna", and "Just Like A Woman" are just a few examples of why it remains to this day as a classic. "Frank Sinatra, The Voice - Factory Sealed CBS MasterSound Gold CD"
CBS Master Sound 24K Gold CD. Originally released in 1955, The Voice is generally considered Sinatra's best full long-playing 12"disc from his Columbia years. Hear the styling that marked his transition from big-band singer to supplanting Bing as the male vocalist for the next 3 decades. Tracks Include: "I Don't Know Why (I Just Do)" "Try a Little Tenderness" "I Don't Stand a Ghost of a Chance With You" "Paradise" "These Foolish Things" "Laura" "She's Funny That Way" "Fools Rush In" "Over the Rainbow" "That Old Black Magic" "Spring Is Here" "Lover". "Gloria Estefan, Let It Loose (only one)"
"Jeff Beck, Blow by Blow - Factory Sealed CBS MasterSound 24-Karat Gold CD"
CBS Master Sound 24K Gold CD "Last Copy". 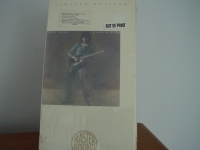 Personnel: Jeff Beck (guitar); Max Middleton (keyboards); Phil Chenn (bass); Richard Bailey (drums, percussion). Recorded at AIR Studios, London, England. Realizing the overwhelming response he received in concert with his extended instrumental breaks, Beck finally bit the bullet and released his first all-instrumental work in 1975. The jazz-rock tour de force BLOW BY BLOW was produced by Beatles mainman George Martin and proved that Beck's six-string skills could easily carry an album. Completely inspired by the challenge and surrounded by a stellar band and solid compositions, Beck lets loose throughout. The result is one of his very best works. Highlights include the funky opening track "You Know What I Mean," a pair of Stevie Wonder-penned tracks ("Cause We've Ended as Lovers" and "Thelonious"), and the classic rock-radio staple "Freeway Jam." Tracks Include: "You Know What I Mean" "She's A Woman" "Constipated Duck" "AIR Blower" "Scatterbrain" "Cause We've Ended As Lovers" "Thelonius" "Freeway Jam" "Diamond Dust". "Jeff Beck, Blow by Blow-Long Box"
CBS Master Sound 24K Gold CD "Last Copy"
"Meat Loaf, Bat Out of Hell - CBS MasterSound Factory Sealed 24 Karat Gold CD"
CBS Master Sound 24K Gold CD. Tracks Include: "Bat out of Hell" "You Took the Words Right Out of My Mouth" "Heaven can Wait" "All Revved Up With No Place To Go" "Two Out Of Three Ain't Bad" "Paradise By The Dashboard Light" "For Crying Out Loud" "Great Boleros of Riding"
"Roy Orbison, Lonely & Blue (only 2)"
CBS Master Sound 24K Gold CD. Recorded during a one-year period beginning September 18, 1959, this was Roy's first hit record and his first with producer Fred Foster and Monument Records. Tracks Include: "Only The Lonely (Know The Way I Feel)" "Bye-Bye, Love" "Cry" "Blue Avenue" "I can't Stop Loving You" "Come Back To Me (My Love)" "Blue Angel" "Raindrops" "(I'd Be) A Legend In My Time" "I'm Hurtin'" "Twenty-Two Days" "I'll Say It's My Fault"
"Simon & Garfunkel, Bridge Over Troubled Water - CURRENTLY SOLD OUT"
Paul Simon & Art Garfunkel - Bridge Over Troubled Water Tremendously rare Gold 24-Karat CBS Sealed Limited Edition CD Long Out Of Print Please notice the unique packaging that exhibits the Gold CD and Original LP cover inside the Factory Seal. This expensive standard of quality package is only found in these 24-Karat Gold Masterpiece. This copy is also the rarest addition because it has the pressing date engraved into the spacer on the CD itself.No other manufacture (MFSL DCC MCA etc) ever gave the collectors this Limited Edition engraving to verify the date of pressing. "Bridge Over Troubled Water" was rated the 33rd Best Album of All-Time and Simon & Garfunkel have been rated the 72nd Best Artists of All-Time. The CBS "Bridge Over Troubled Water" was the only 24-Karat Gold Pressing of this Album classic. 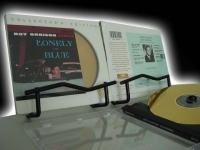 This CBS Collector's Edition, besides receiving rave reviews from Stereophile, Audio and Musician Magazine, has the best picture disc graphics ever produced on 24-Karat Gold CDs. This recording includes Simon & Garfunkel's Bridge Over Troubled Water (recently rated the 30th Best Rock n Roll Single of All-Time), as well as - Celia, Baby Driver - Keep The Customer Satisfied - The Boxer and much more. When you put all the math together, it adds up to a 24-Karat gem that every collector should own. 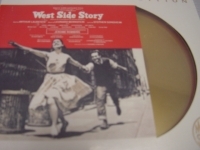 "West Side Story, Original Broadway Cast - Factory Sealed CBS Mastersound Gold CD - Last Copy"
"Wynton Marsalis, ST - CBS MasterSound Longbox"
Wynton Marsalis - WYTON MARSALIS - Longbox 24-Karat Gold CBS Sealed CD - First Edition - LAST COPY FOREVER Japan Pressed Long Box Long Out of Print and one of the Rarest in the Audiophile Gold CD Market. As every collector knows, in the years to come, First Generation CDs (CBS) should be valued higher than Second Generation Pressings (MFSL) -- especially First Generation Long Box Japanese Pressed! What a tremendous GIFT will Masterpiece of GOLD will make any true fan!! Wynton Marsalis's 1982 debut was recorded before the trumpeter had reached his 20th birthday and when he was still a member of Art Blakey's Jazz Messengers. In many ways, it was a pivotal event for Jazz in the eighties. 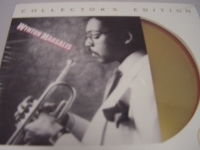 As Marsalis became the central figure in a return to the acoustic style of the late fifties and sixties and the model for all young lions to come. While there are elements of Miles Davis in Marsalis' style, the strongest parallels are with Lee Morgan and Freddie Hubbard. The pyrotechnic trumpeters who arrived at about the same age in the late fifties and who first made their talents known in Blakey's group. Even with a Harmon mute on Ron Carter's JR, Marsalis suggests Hubbard's precise articulation. Saxophonist Branford Marsalis recalls Wayne Shorter's prefusion style and Herbie Hancock, Ron Carter and Tony Williams featured on four tracks pick up where they had left off with Miles Davis and on numerous Blue Note dates. The music is taut, thoughtful, and filled with youth bravado but more fascinating still is how a leading edge style of the sixties succumbed to fusion in the seventies only to return as a full blown conservative movement in the next decade. Selections include Father Time - I'll Be There When The Time Is Right - RJ - Hesitation - Sister Cheryl - Who Can I Turn To - Twilight. James Taylor, James Taylor - CBS MasterSound MINT Gold CD"
James Taylor, James Taylor CBS MASTERSOUND 24K MINT CD - WITH OUTER CARDBOARD SLIPCASE Track listing 1. Your Smiling Face 2. There We Are 3. Honey Don't Leave L.A. 4. Another Grey Morning 5. Bartender's Blues 6. Secret O' Life 7. Handy Man 8. I Was Only Telling a Lie 9. Looking For Love on Broadway 10. Terra Nova 11. Traffic Jam 12. If I Keep My Heart Out of Sight Details Contributing artists: Carly Simon, David Sanborn, Linda Ronstadt, Red Callender Producer: Peter Asher Distributor: Sony Music Distribution ( Recording type: Studio Recording mode: Stereo SPAR Code: n/a Album notes Personnel: James Taylor (vocals, acoustic guitar); Linda Rondstadt, Carly Simon (vocals); Danny Kortchmar (guitar); Dan Dugmore (steel guitar); David Campbell (viola); David Sanborn (saxophone); Red Callender (tuba); Dr. Clarence McDonald (keyboards); Leland Sklar (bass); Russ Kunkel (drums, percussion); Peter Asher (percussion); Leah Kunkel (background vocals). Master Sound releases are 24-karat gold CDs remastered from first generation masters. This process utilizes 20-bit technology and Sony's "Super Bit Mapping" system. JT finds a young James Taylor using a wide variety of molds into which he pours his folksy, easy-going style. His considerable songwriting skills are in full bloom, beginning with the jubilant "Your Smiling Face." Some very different ground is explored, however, with the funky "Honey, Don't Leave L.A." and the authentic country of "Bartender's Blues," on which Taylor gets a little help from Linda Ronstadt. It's his relationship with Carly Simon, though, that provides the fuel for Taylor's trademark lighter-than-air styling on "There We Are," "Another Grey Morning" and "Terra Nova," where Simon herself contributes a fine vocal performance. Taylor's lovely "Secret O' Life" is worth the price of admission for any singer-songwriter enthusiast. Other points of interest include Taylor's cover of the Jimmy Jones hit "Handyman" and the jazzy "Traffic Jam." Besides his GREATEST HITS package, this is one of J.T. 's most definitive works.